Thank you to everyone who submitted their stories about their Dads and pancakes. Click on comments below “Win a Free Griddle” post to read all of the great memories shared. We will be drawing for the Electric Griddle today. Watch your e-mail! 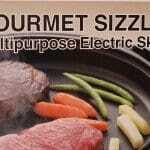 Now available is our favorite electric griddle for making anything from Sturdiwheat pancakes to Cajun chicken strips. It ships for free and you will receive a 5 pack of assorted Sturdiwheat Pancake mixes all for $94.99! Buy it here.